The Idaho State Board of Education fired University of Idaho athletics director Rob Spear on Thursday morning. The action concludes a four-month administrative leave for Spear. He was suspended by UI president Chuck Staben in April following complaints from two former Vandals women athletes that Spear five years prior did not appropriately address the fact they had been sexually harassed and in one case inappropriately touched by a former Vandals football player. Mike Keckler, the board’s information officer, said the board will pay the remainder of Spear’s contract, which runs through Feb. 2020. The board’s decision came after three separate closed sessions over the past two months in which it discussed Spear’s fate. The latest of those was Wednesday. All this led to a brief report from board member Emma Atchley to her colleagues Thursday, and without debate the board voted unanimously to terminate Spear’s employment. Atchley said Staben had asked to recuse himself from the matter, citing potential conflict of interest. Given that, she said, board members gave no weight to his input. About a month after Staben suspended Spear, the board decided to end Staben’s tenure as president at the conclusion of the current academic year. Atchley also cited a UI consultant’s report that the university five years ago did not adequately inform campus administrators about significant changes to federal Title IX policies that gave them wider latitude in investigating complaints about harassment that took place off campus. Spear has said his misunderstanding of UI’s investigation authority limited his ability to aggressively pursue one of the former athletes’ complaints. His more recent actions suggest he took harassment seriously. Staben has acknowledged in recent years Spear has been a leader at UI in seeking out and bringing to campus training about harassment issues and teaching students about their responsibilities to avoid sexual harassment. In Spear’s absence, associate athletic director for revenue Pete Isakson has served as interim athletics director. 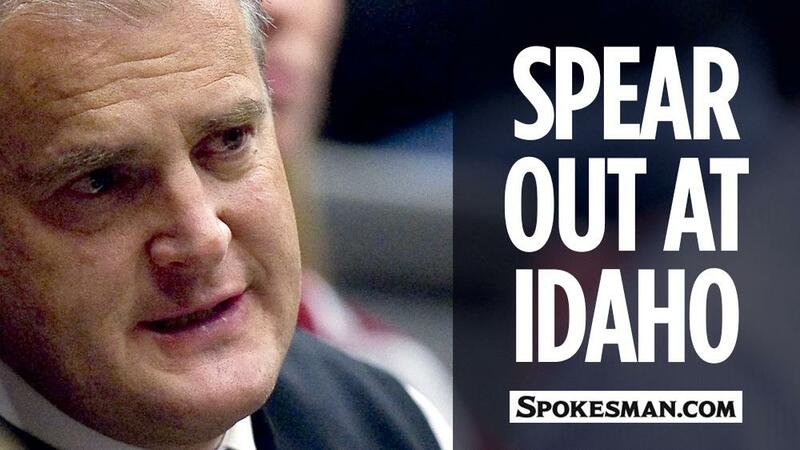 After Spear’s firing, Idaho released a statement. Spear moved from a position in the Idaho College of Agriculture to head the athletics department on an interim basis in late 2003 before being given the permanent position in January 2004. The Vandals have enjoyed recent success on his watch, winning 20 conference titles in the past four seasons. The football team won the Famous Idaho Potato Bowl two years ago, and the women’s basketball team has played in the NCAA tournament. Spear also led a number of initiatives. Safety and viewing enhancement upgrades to the Kibbie Dome were made. A synthetic turf field adjacent to the dome was installed. The Idaho athletics hall of fame was established, and a $10 million donation for a new basketball arena was secured. Idaho also had two athletes named first-team Academic All-Americans in the past year, women’s basketball player Mikayla Ferenz, and football player Jacob Sannon. Published: Aug. 16, 2018, 9:57 a.m. Updated: Aug. 16, 2018, 7:02 p.m.